If you’re missing teeth, it’s important to replace them as soon as possible. Not only do missing teeth detract from your appearance, but they also make it harder to chew and eat food. Also, the longer they’re missing, the greater the impact to the rest of your smile. You’ll be at risk for bone loss, and your other teeth will gradually move to fill the gap, creating even more problems. If you live in the Houston, Bellaire, Briargrove, Bunker Hill Village, Galleria, Hunters Creek Village, Katy, Lamar Terrace, Meyerland, or Stafford areas, you have lots of choice when it comes to replacing your missing teeth. It’s important to research and find the dentist or oral surgeon that is best suited for your needs. You’ll start with a consultation to assess the needs of your smile and to determine the right solution for you. Dental implants could be a great solution for your smile, no matter how many teeth you’re missing. They offer a more secure fit than dentures, and don’t risk damage or decay of your other teeth like bridges do. 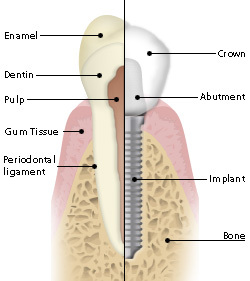 For dental implants, a titanium post will be inserted into your jaw bone to anchor each replacement tooth. Over time, the post will bond with your jaw, creating a secure base for your implant that mimics the root of a natural tooth. Once the post is securely attached to your jaw it will be topped with a porcelain crown, leaving you with a full, natural-looking smile. Your replacement teeth can be permanent or removable, depending on your smile needs. If you’re missing teeth and want to see if dental implants could be right for your smile, call your Houston, Bellaire, Briargrove, Bunker Hill Village, Galleria, Hunters Creek Village, Katy, Lamar Terrace, Meyerland, or Stafford area dentist or oral surgery center. Everyone deserves to have a full, beautiful smile.